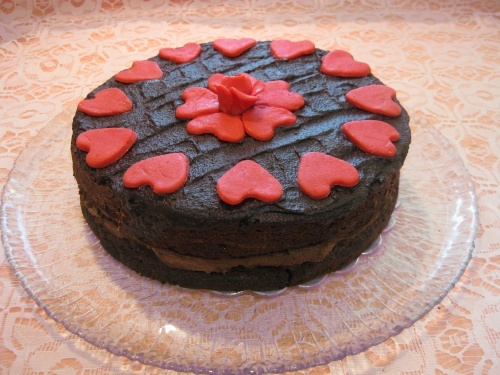 This is a very chocolately cake with both filling and icing of ganache. Because we have Valentine’s day this month I have added marzipan hearts but you can decorate it to your own choice or leave it plain. You will need a deep 20cm/8in round cake tin and if you are decorating with hearts you will need a small cutter. Line the tin with greaseproof paper and grease it. Heat the oven to Gas 4/180C. In a bowl over a pan of hot water put the chocolate, butter and 1 tablespoon of hot water. Stir occasionally until they are melted, then remove the bowl from the pan. Whisk the egg yolks and sugar in a mixing bowl over the pan of hot water until thick and the whisk leaves a trail when lifted. Remove from the pan and stir in the melted chocolate. Mix together the flour and ground almonds and carefully fold them into the mixture. Wash and dry the whisk to whisk the egg whites until stiff then fold them into the mixture a quarter at a time, being careful not to over mix. Pour into the tin and bake for approximately 45 minutes or until the centre is firm to a fingertip touch. Cool in the tin for a few minutes, then turn out onto a cooling rack. Filling: place the 25g chocolate and 1 tablespoon of cream in a bowl and melt over hot water. In a separate bowl whip the remaining cream just until soft and fold in the melting chocolate. Cut the cake across into two layers and sandwich them together with the filling. Icing: in a small pan very gently melt the 75g of chocolate and the 2 fl oz of cream. Stir until smooth and leave to cool until thick enough to spread over the cake. Mark lines with a palette knife. Decoration: this is completely optional for Valentine’s day. Colour the marzipan pink or red. Roll it out and cut out heart shapes. Place these around the edge of the top of the cake. I have made a small rose to put in the centre but this is your choice. Note: use chocolate which is 70% cocoa butter.